The Posiflex All-in-one POS machine is a whole new generation of high-end all-in-one POS terminal, packing innovativeness and functionalities in compact design with stylish look. It is the perfect fit for retail businesses where space is at premium. Posiflex All-in-one POS machine is the solution for the counter space problem and it comes with Android and Windows version that integrates the most widely used peripherals options in daily POS operation including thermal printer (detachable printer for easy maintenance), MSR, fingerprint sensor, smart card reader,scanner and 2nd customer display. Its compact all-in-one design frees more room for counter space, so that the store owner can display and promote more merchandizes to maximize sales opportunities. 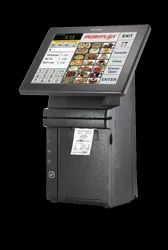 Posiflex HS-2410A is an Android version all-in-one POS in HS Series. 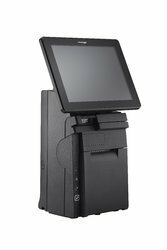 Powered by Latest Android 7.0 Winner A64 Quad Core Processor, it offers vastly superior performance than most of the Android based POS terminals that used other processor brands. The HS-2414A integrates the most widely used peripherals options in daily POS operation including 3” auto cutter thermal printer, MSR, and 2nd customer display. Offered in black or white, the HS-2414A is not just a piece of machinery, it is an elegantly crafted piece of art that looks right at home in any store decoration. The HS-2414W-3A is the best value option for Mom & Pop stores where the counter space needed to be maximized smartly. It is an Windows based all-in-one POS featuring a detachable printer for easy maintenance, and can be integrated the most widely used peripheral options in daily POS operation and widely used in White goods, Food & Beverages, Telecom, Jewellery, Department Stores, Super/Hypermarket, Flower Shop. Space is money; the HS-2414W- 3a creates more precious counter space to display and to promote more merchandize, thus increasing profit returns for the store owner. As an “all-in-one” solution, the HS-2414W- 3A offers great benefits while still maintains adequate performance with its ARM based quad core processor. With stylish touches added throughout, the HS-2414W- 3A is not just a piece of machinery; it is an elegantly crafted piece of art that looks right at home in any store decoration. The HS-2415W-3A is the best value option for Mom & Pop stores where the counter space needed to be maximized smartly. It is an Windows based all-in-one POS featuring a detachable printer for easy maintenance, and can be integrated the most widely used peripheral options in daily POS operation and widely used in White goods, Food & Beverages, Telecom, Jewellery, Department Stores, Super/Hypermarket, Flower Shop. Space is money; the HS-2415W- 3a creates more precious counter space to display and to promote more merchandize, thus increasing profit returns for the store owner. As an “all-in-one” solution, the HS-2415W- 3A offers great benefits while still maintains adequate performance with its ARM based quad core processor. With stylish touches added throughout, the HS-2415W- 3Ais not just a piece of machinery; it is an elegantly crafted piece of art that looks right at home in any store decoration.